Ben - Scientists have taken the first steps towards interrogating anti-matter and find out more about this mysterious material. It sounds like the stuff of science fiction but anti-matter is a reality. It can be made in the laboratory and it's even used in medical imaging during things like PET scanning. It is something of an enigma though, the rules of physics say that there should be at least as much anti-matter in the universe as there is normal matter - the matter that we're made from - but scientists can't find it, suggesting either that we've got something wrong in our basic physics or that something else very exciting and important must be going on. The problem isn't trivial to study though because when anti-matter and normal matter come into contact, they annihilate each other and now, reporting in the journal Nature, scientists have made a very big step towards developing a way to measure anti-matter and this time, they're using microwaves. Chris Smith spoke to CERN scientist, Jeffrey Hangst. Jeffrey - We're working on the ant-matter atom called anti-hydrogen. The simplest matter, or anti-matter atom you can imagine which consists of an anti-proton and a positron. We're at CERN in Geneva because we need the particle accelerator to produce the anti-protons, which is the nucleus of anti-hydrogen atom, positrons we get from a radioactive source. We've been working for a long time to learn how to put those two things together to make anti-hydrogen and that's what we'd like to study. Chris - When you make some anti-hydrogen, how do you keep it in one place because it's not trivial to contain hydrogen in the first place? How do you keep anti-hydrogen which will just annihilate if it touches anything in something that you can study? Jeffrey - Yes, it's a good question. It's actually easy to contain anti-protons which have an electric charge and positrons which also have an electric charge, but when you put the two together, you get a neutral atom, no charge. In order to contain that, we use very strong magnetic fields. The atom, the anti-atom, has a little bit of a magnetic character. So if you put in a very, very strong and inhomogeneous magnetic field, you can trap it. It's sort of a magnetic bottle. The problem is that in order to hold on to an anti-atom of anti-hydrogen, it has to be very, very cold. In our case, we can hold an atom if it's 0.5 degrees above absolute zero or less. So that's been the challenge that we only recently overcame - to hold on to these atoms once they're produced. Chris - Is that because if you were to raise the temperature at all, then the atoms would have too much kinetic energy? They'd be moving too fast and that would make it very difficult to hang on to them? So by cooling them down, you slow them down, and it's easier to keep them in that flask. Jeffrey - We actually have to produce them cold. They're produced in the magnetic bottle and if they're not moving too fast, they'd stay there. The whole idea is to start with them cold. We can't cool them down after their formed. If you think of it as a marble rolling in a bowl, if the marble is rolling too fast, it will go over the lip of the bowl. In our case, the marble, the anti-hydrogen atom is produced inside the bowl with some velocity. If that velocity is too high, it just rolls out and annihilates. So the whole trick is to produce it cold in the first place because we don't have any way to cool it down after it's made. Chris - And now you know that you can make them and you can keep them in a stable state for a thousand seconds, the question is, how do we study them? Jeffrey - When we do this experiment, we have on the average, one atom at a time of anti-hydrogen. That's not a lot. You could never do an experiment with only one atom of a matter at a time. So what we do now, I mentioned that it is a magnetic interaction that holds the atoms in the magnetic bottle. Let's go back to the bowl analogy. Think of the atom as a compass needle on a microscopic scale. If that compass needle was pointing in the correct direction with respect to this magnetic field, it wants to stay in the bowl. If you flip that little compass needle in the opposite direction, it's suddenly as if you put the marble on top of an upturned bowl and it just wants to roll away. So what we do in this experiment is we shine some radiation, some microwaves onto the trapped atoms and if you get the frequency of those microwaves exactly right, it'll flip the magnetic direction of the atom. So it goes from wanting to be trapped in this magnetic bowl to wanting to roll out. When it does roll out, it hits some matter in the walls of our device and annihilates. So, we tune our microwaves, make the atom fall out, and then detect that it annihilates. We're very good at detecting that annihilation on a microscopic scale. It releases a lot of energy and we can see one atom. Chris - What is that actually telling you about the structure of the anti-hydrogen? Are you able to do the analogous experiment with hydrogen and then say, "Well, look. It interacts with microwaves in exactly the same way"? Jeffrey - Yes, so what you'd learn is for example, how strong is this magnetic character of the particles that make up anti-hydrogen? And those are fundamental constants. We call them the spin and magnetic moment of the particles. 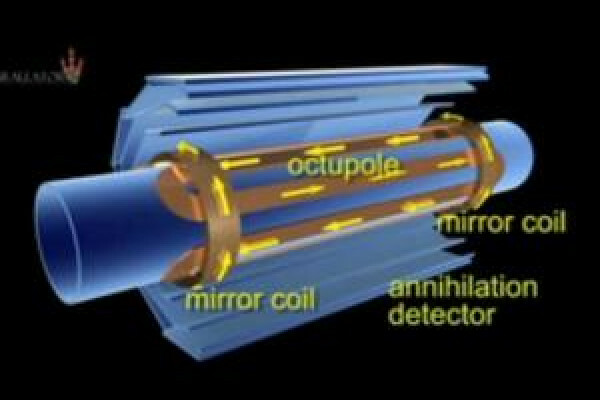 We know very, very well the spin or the magnetic moment of the proton and of the electron and also, the positron, it's been measured independently. What we get at with this one is the magnetic size, if you will, of the anti-proton. That's something that isn't known very well today, only to about a few parts in a thousand where in atomic physics, a good measurement is one part in 10 to the 15, that's 1 with 15 zeros after it. So, we're just starting to measure this type of atom. That's the kind of precision that people have on other measurements in hydrogen. So, we're looking to compare the fundamental constants that characterise anti-matter and see if they're the same as the very, very well measured one in hydrogen. Chris - One of the other big outstanding questions is of course, where all the anti-matter has gone in the whole universe. This, if you can work out how to measure anti-matter and spot it in the characteristic or finger print way, means that you can then turn your looking glass on the universe at large and ask that question, where is all the anti-matter? Jeffrey - It's not clear that we'll be able to directly address that question. Supposing we do find a difference between hydrogen and anti-hydrogen, it may or may not point in some direction that could help us understand the evolution of the universe. There's no theory right now that says, what such difference might look like or how it might manifest itself in a particular measurement. So, our philosophy is, we have this huge puzzle. Anytime you can get your hands on some anti-matter, you have a moral obligation to go and look very carefully. So that's what we're doing. If there is a difference, it'll be up to some theorists to sort that out and I'd look forward to that. Ben - And we will look forward to hearing about this. That was CERN scientist, Jeffrey Hangst, talking to Chris Smith. Next Antarctic Invasion and Chimp Cops!